Nevada seems to churn out solid quarterbacks year after year and Cody Fajardo is next in line. Only a sophomore, Fajardo is already just seven yards shy of 4,500 for his career and has 26 touchdown passes. He is also a running quarterback, rushing for over 1,000 yards in 2012 with 12 touchdowns to go with it. The Wolf Pack will continue to be a threat next season with him behind center and look for Fajardo to break a plethora of school records. Arizona State fans are ecstatic that Taylor Kelly is just a sophomore while the rest of the Pac 12 is not so happy. Although if he does well enough in his junior season, the Sun Devil quarterback will likely take his talents to the NFL. Kelly led the Sun Devils to an 8-5 record this season, including a bowl win over Navy, and passed for over 3,000 yards with 29 touchdowns. He is not particularly a strong runner, but can escape pressure and get the needed yardage when the time calls for such a play. Scary talent for such a young kid. Sophomore Utah State quarterback Chuckie Keeton doesn’t get enough praise for the job he did in his second season as starter. He led the Aggies to their best season in school history (11-2) while passing for 3,373 yards and 27 touchdowns with just nine interceptions. His completion percentage was above 67 and he looked dazzling all season long whether he was making a quick scramble, or passing in the pocket. With two seasons under his belt, he is the veteran quarterback that the Aggies need. Well, I know this isn’t much of a shocker, but Johnny Manziel, or ‘Johnny Football’ as he is also known, is easily the best quarterback in the nation. 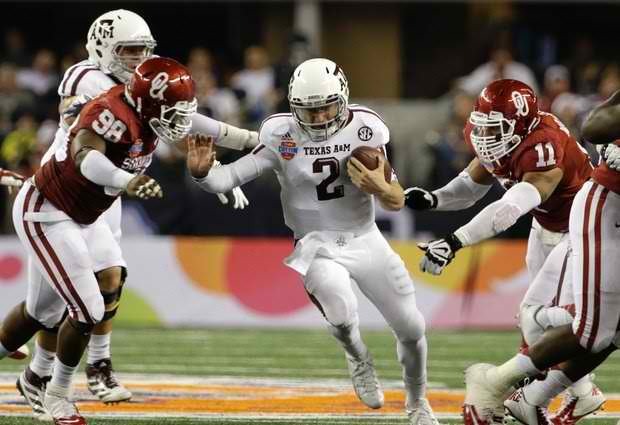 The freshman quarterback capped off his Heisman-winning season with a Cotton Bowl win over Oklahoma and looked good throughout. Just when we thought we saw everything we could from Manziel, he passed for 287 yards and ran for 229 yards with four total touchdowns in their bowl win over the Sooners. He accumulated over 5,000 yards of total offense to go along with 47 total touchdowns. It’s going to be very difficult to top the freshman in the Heisman race next season.